Thank you to everyone who has contacted PRO via social media and email with a question this week. Q) What is PRO’s guidance on ending periods? Even after added time, many refs apply a soft advantage and end the match only after the current attack ends. Is this encouraged by PRO? If so, what’s the guidance, and where is the basis in the Laws of the Game? A) As per IFAB Law 7 (The Duration of the Match) the referee is permitted by law to increase (but not reduce) additional time at the end of each playing period. In terms of referee guidance on finishing the half or game, firstly the referee must be sure play has been allowed to continue to the minimum indicated stoppage time. For example, if a referee indicates a minimum of three minutes at the end of the first half and the ball goes out of play for a corner kick at 47:58, the referee will allow the corner kick because the stoppage will push minimum time over the three-minute mark. In doing so, referees are also encouraged to finish the period with play in a ‘neutral’ area of the field. This takes away any allegation of attempting to prevent a promising attack or goal-scoring opportunity by calling time. What soccer ultimately expects is the opportunity for the attack to be allowed rather than cutting a half or game at one of the most exciting times in a game. Q) Why don’t you provide more communication with respect to VAR? Other sports provide audio between officials to the TV audience to understand what’s going on (See Aussie Rules for example). A) As the Video Review process matures, we are continually improving our methods for communicating the final on-field decisions to fans, broadcasters, and the media. Presently, we utilize a message system to immediately notify broadcasters, club PR staffs, and in-stadium announcers that a review is under way and for which type of potential game-changing incident. Once the review has completed, a second message is sent to them which includes the final decision, the reasoning for that decision, and the definitive camera angle that helped the referee arrive at that decision. Questions can be sent in via social media using the #AskPRO hashtag or to emailed to website@proreferees.com. Q) Why are FIFA rules interpreted in a stricter manner in MLS than elsewhere? A) Although the Laws of the Game are universal across the World, soccer has a slightly different culture in various places. Every referee globally has a duty to protect the players from injuries that could be caused by serious foul play or violent conduct. By being proactive when possible, and by dealing firmly with such situations when they occur, we try to avoid such situations through strong, consistent punishment of actions that endanger the safety of players work as an effective deterrent. Referees are also tasked with differentiating between challenges which are reckless and those which involve excessive force or brutality. Some situations are very clear and would be dealt with the same in every part of the world. However, sometimes a subjective judgment must be made by the referee as to which category the action falls into, and this is where soccer culture sometimes comes into play. In these subjective areas, what is considered excessive force in one place might not be considered as such elsewhere. Where the threshold lies as to what is acceptable can slightly vary. Expectations from the soccer community varies from place to place, although the gap is certainly closing globally. MLS is a young, growing league where match officials are encouraged by the whole soccer community to draw the line as to what is acceptable or not in a place which deters physical play that can result in serious injury, thereby enabling the best players to perform on the field of play. Q) Was Efrain Juarez sent off for language? Kevin Stott indicates a Video Review, then issues a red to Juarez – is there language VAR now? 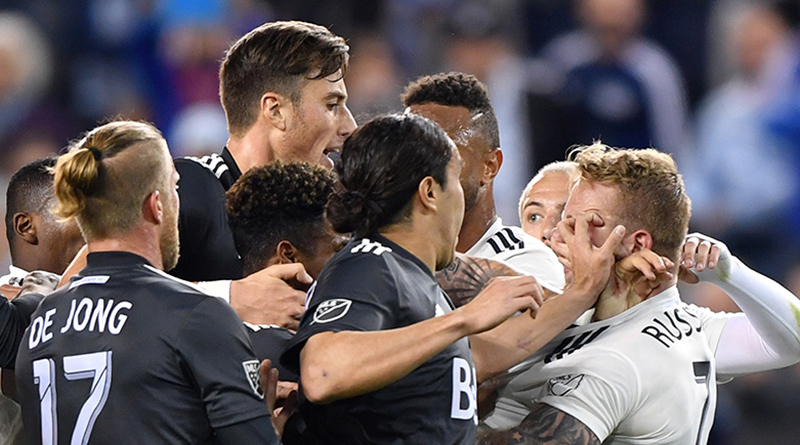 A) In the Sporting Kansas City vs Vancouver Whitecaps game, Efrain Juarez was sent off for an act of violent conduct towards an opponent during the mass confrontation which took place in the first half of the game. Juarez’s actions were not seen by the on-field match officials and as such a Video Review was recommended by the VAR, who had checked and analyzed the situation on the broadcast feeds from the Video Operations Room. Foul language is not something which is normally dealt with by VARs, although extremely offensive, insulting or abusive conduct can be acted upon if seen on the broadcast footage by the VAR. In fact, such behavior can be actioned by the VAR as soon as it comes to light, even if the game has re-started after the action took place. An example would be when a player makes an obscene gesture to the technical area of the opposing team. This is not seen by the match officials at the time and is only seen on the broadcast feeds by the VAR some minutes later. Even though there may have been a number of re-starts after the action took place, the VAR can still recommend to the referee that the referee review footage at the pitchside monitor, which in turn could lead to a red card for the player. This also applies to acts of violent conduct, which can be dealt with at any time, regardless of the fact that the game may have re-started after the conduct took place. In all other cases, a re-start negates the possibility of recommending a review. For example, if there is a penalty appeal and allowing the game to play-on leads to a throw-in, the VAR cannot recommend a review if the throw-in is allowed to be taken and the game re-starts, even if the footage shows that the referee made a clear and obvious error in not awarding a penalty kick. That’s why you will see referees holding the re-start while the play is being checked and analyzed. The referee indicates a check is under way by placing a finger to the ear. This allows the VAR to complete the check prior to the game re-starting.